Before you apply the third maintenance release for SAS 9.2, you should review the list of products that will be updated on a machine. From the SAS Deployment Wizard, you can generate a Deployment Summary. For more information, see About the Deployment Summary. The list of product updates could vary for each machine at your site. Therefore, you need to generate a Deployment Summary on every machine that runs SAS 9.2. Note: If no product updates are required for a machine, then you will not see a Deployment Summary, and your installation of the maintenance release is complete on that machine. Run the SAS Deployment Wizard from the software depot that contains your maintenance order. You must use the same user ID that you used to install SAS 9.2. Note: If you are running in a Windows environment, you must be an administrator to run the SAS Deployment Wizard, but you do not have to use the same user ID that you used to install SAS 9.2. If you are running in a UNIX environment, you must use the same user ID that you used to install SAS 9.2. For both operating environments, the SDW.log file indicates whether your user ID is different from the one that you used to install SAS 9.2. Double-click setup.exe in the highest-level directory of your SAS Software Depot. Execute setup.sh from the highest-level directory of your SAS Software Depot. Type the following command: run setup_vms.exe. Run setup.rexx from the highest-level directory of your SAS Software Depot. To use a temporary directory other than /tmp, specify –templocation new-temp-dir. In the Review Required Updates step, click Print to print the Deployment Summary for your site. Review the list of products in the Update Summary section. For more information, see Update Summary. Alternatively, you can copy and paste this content into another document, such as an e-mail or a spreadsheet. In a spreadsheet, you can sort the data alphabetically by product name. Note: If no product updates are required, then the Deployment Summary does not appear, and you can exit the SAS Deployment Wizard. Because you are not installing any software at this time, click Cancel to exit the SAS Deployment Wizard. 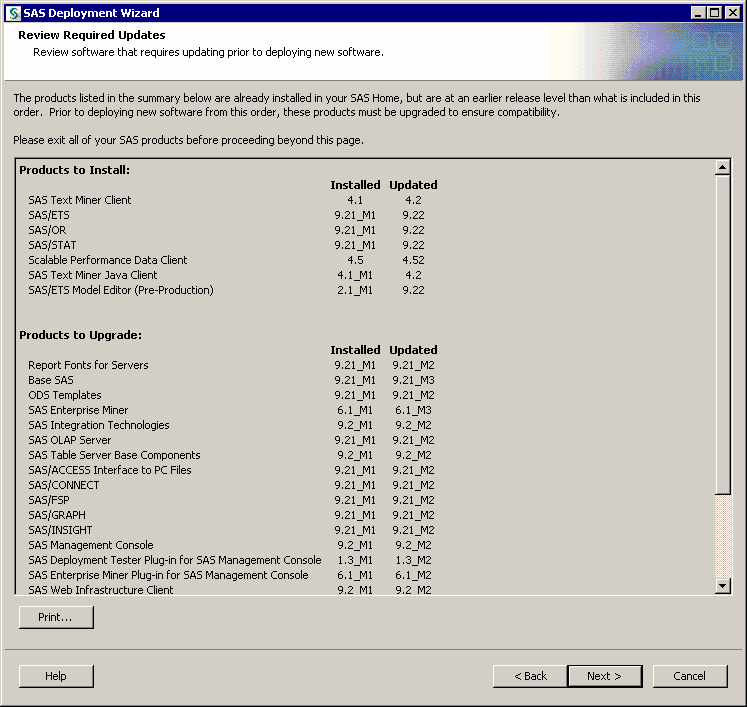 After reviewing the contents of the Deployment Summary and assessing the effect on products at your site, you can install these product updates by restarting the SAS Deployment Wizard. Note: When you exit the SAS Deployment Wizard, a copy of the Deployment Summary is not saved to the /InstallMisc/InstallLogs/. A Deployment Summary is not saved to this directory until you install the software update. After obtaining this list of products, review the “Product-Specific Details and Post-Configuration Requirements” chapter in Parts 2, 3, and 4 of this document. For post-configuration steps for applying the third maintenance release for SAS 9.2, see Product-Specific Details and Post-Configuration Requirements in Part 2. For post-configuration steps for applying a product-specific maintenance release, see Product-Specific Details and Post-Configuration Requirements in Part 3. For post-configuration steps for upgrading to a new product release, see Product-Specific Details and Post-Configuration Requirements in Part 4. If no topic is listed for a product, then no post-configurations steps are required for that product.